Did you know it can take about 18 hours for your body to digest and get rid of just one meal? The human body amazes me… and totally grosses me out. 18 hours??! Add two more meals to that, plus snacks, and imagine how much hard work your insides are doing each and every day. I’d never really given much thought to offering my digestive system a break, and despite having heard lots of friends rave about all the health benefits they reaped from juicing, I never fully appreciated the concept of a juice fast, or a juice cleanse. That is, until I started reading more about it and looking at the skin of my friends and clients during their time off from chewing. So what are the benefits of regular juicing? Juice cleanses? Juice fasts? What’s the difference between those three? Regular juicing is what I’ve been doing for years: grabbing a green juice on my way home from yoga a few times a week. Treating myself to a juice as a pick-me-up when everyone else on set is having a coffee drink. My good friend Michelle regularly juices every morning before eating breakfast. She says she loves it and feels so enlivened as a result. 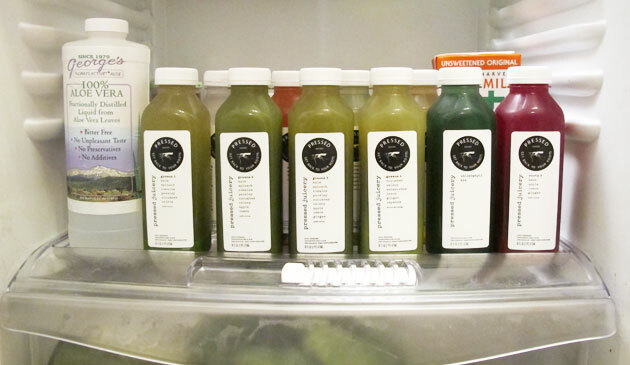 Juice cleanses and juice fasts come in a number of different styles. Some have you fasting from solid food for one or two days, giving the digestive system a break from heavy work, while drinking your vitamins and minerals in the form of a number of juices throughout the day. Others stick to rigid fasts where you refrain from eating for 7 to 14 days – and sometimes even longer periods of time. I have countless friends some would consider health nuts who’ve been juicing for decades, and plenty of friends who sporadically do it after a long weekend of eating poorly, boozing it up, and depriving themselves of sleep. Since I don’t want to miss out on anything this life has to offer, I figured it was about time I tried juicing for myself. I probably never would have tried a full day of juicing if the awesome people at Pressed Juicery hadn’t made it so easy for me. I want to drink juice, I just don’t want to make the time to wash, de-stem, chop all the vegetables and clean the blender, let alone make sure to have enough -but not too much – produce in the fridge to get me through the day. I prepared myself by eating exactly the same way I always eat: super healthfully. Would juicing really be beneficial to someone like me who gets made fun of for bringing a cucumber and some wax beans as my afternoon snack? I’d read that if you’re a meat eater, or consume caffeine regularly you should wean yourself off in the days leading up to your fast. The only other thing I did to prepare for my fast was to clear my refrigerator and cupboards of any treats –the things that call to me when I’m sitting on the couch. I woke up excited to drink the bottle labeled ‘Green Juice #1’. It was delicious! I did as I was told, and drank a big glass of water between every juice. Pressed Juicery included a bottle of aloe vera water and a bottle of chlorophyl, which together have super powers including: anti-inflammatory and blood cleaning properties, they act as digestion and detoxification aids and chlorophyl is full of vitamins and minerals. They also function as cellular regenerators with anti-bacterial and anti-fungal properties. Nice! I made it through my very busy work day with only minor issues: i didn’t know that my afternoon job would last so long, and I’d only brought two drinks with me. By the end of the 5 hours I was super hungry, and a little light headed, and grateful that the hairstylist who was working with me does regular juice fasts, and helped get me through it without caving in and eating the cookies sitting near the makeup table. No!!! My only regret is that I only juiced for one day. Everything I’ve heard, and everything that I’ve read on the topic confirms, that the increase in energy and clarity most people feel usually kicks in on day three or four… and that before that it’s normal to feel a little less than incredible. Am I going to do it again for a longer period of time? Absolutely. Anyone want to do it with me? I’m better at this kind of thing if I have a partner or two. One thing my single day of juice fasting-and my new regular workout schedule with a trainer- has done for me is to rekindle my interest in incorporating more greens juices into my weekly diet. On the mornings when I’m not working out first thing I’ve been drinking a green veggie juice and feeling super energized, and I’ll continue to treat myself with a greens juice late in the afternoon as a little pick me up. One final and fantastic thing: Here in NYC fashion week is about to start, and the folks of the awesome online resource on all things healthy lifestyle, thechalkboardmag.com, have partnered with some great green beauty lines to bring straight to your door, a fashion week survival kit – no matter where you live. You can order yours here.